High school and youth sports teams may lack the deep pockets of the pros, but they can still take advantage of technology for tracking game stats thanks to a New York startup. Angel investor-backed GameChanger Media offers coaches of young athletes a mobile platform that evolves record keeping from pen and paper to smartphones and tablets. “Coaches and scorekeepers of youth and high school teams have incredibly archaic tools for managing what is the most painful and time-consuming part of their job,” says GameChanger Media CEO Ted Sullivan. His company offers youth teams a free app that lets them log game information, which they can then share in real-time with local news outlets and the public. Rather than jotting down notes on a clipboard, the teams punch in the numbers with their mobile devices. 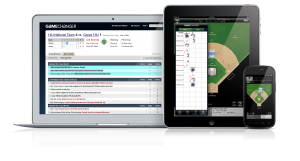 Initially designed for use by baseball and softball teams, the app is available for Android phones, iPhones and the iPad. Sullivan says another version of GameChanger Media’s platform is under development for basketball teams and is due out in beta by midyear 2012 with the full release expected by next winter. Thanks in part to $1 million raised in November from angel investors, Sullivan says he expects to grow his staff of sixteen by 30 percent by the end of 2012. GameChanger Media has raised $3.5 million to date in total from private investors. Founded in 2009, GameChanger Media released its app to the public in January 2010. Sullivan says in 2011, some 30,000 youth and high school teams across country and around the world adopted his company’s tools to record game stats. Amateur baseball governing body USA Baseball, youth sports program Little League International, and high school baseball team tournament host Perfect Game USA all use the platform, Sullivan says. The app is also catching on internationally, Sullivan says. “Our product is only in English, but we have teams from Korea to Germany using it,” he says.